Breaking: Creme Yvette on Shelves in NYC! 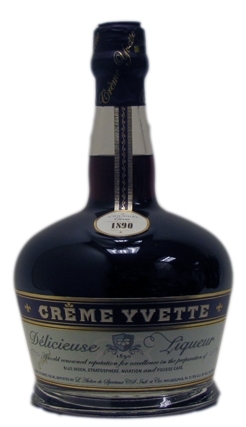 Creme Yvette is now on sale at Astor Wines & Spirits for $41.99! She’s finally here! Although she’s more of a reincarnate than a newborn, Creme Yvette, the highly anticipated liqueur from the makers of St-Germain elderflower liqueur, is now on sale at Astor Wines & Spirits for $41.99. I’m still finding out which other liquor shops are stocking it–Park Avenue Liquor expects to have it soon and there is already a customer waiting list! Featuring notes of berries, spices, honey, vanilla, and a hint of violet petals, Creme Yvette disappeared in 1969, but Robert Cooper’s family has the rights to the recipe and has been fine-tuning it for relaunch. Over the past two years, Creme de Violette has been a hit with mixologists seeking the missing link to a proper Aviation. Classic cocktails that include Yvette are the Blue Moon (2 oz. gin, 3/4 oz. lemon, 1/2 oz. Creme Yvette) and the Union Jack (1 1/2 oz. gin, 1/2 oz. Creme Yvette). I’m excited to see the reddish-purple Yvette make a splash on NYC cocktail menus. Have an idea for a cocktail recipe featuring Creme Yvette? Comment below, and I’ll experiment with some of them–the best recipe will win something cool, I promise! *Correction: I originally said the original recipe for the Aviation, as found in Hugo Ensslin’s 1917 book, “Recipes for Mixed Drinks,” included Creme Yvette–it did not, it calls for Creme de Violette–my apologies. « Breaking: Jane Ballroom to Reopen Super Soon! For Reals! Awesome, thanks for the heads up, just ordered some from Astor, I should have it to play with by Sat. You’re right, I had that wrong. Thank you! Just picked mine up today! They also have Herbsaint which I’m stoked about too. I got the last bottle of the 90 proof Herbsaint, they told me the limited edition “original recipe” 100 prof would be in next week. I’ll be doing reviews on my blog. This is big for us vintage cocktail geeks! Just picked up some Creme Yvette – color is strikingly pink/purple — interesting hue for an aviation. Stir, serve up with a grapefruit twist. That sounds Yummy! I was doing a tequila tasting at Astor the day it came out and used it to tweek a recipe Jake Sher came up with one night at Beekman Bar & Books. Another one we’ll surely have to drive to Ontario for! Pour into Liqueur glass carefully in order listed so that they form layers. Fill small coctail glass with shaved ice. Pour over 1 ounce of any cordial and serve with two short straws. Was every last bottle of the old Yvette consumed? I’d like to get my hands on a bottle of the stuff (and supposedly the ‘certified color’ mention on the old label is a telltale sign). I’m wary of the taste difference with the new stuff before I buy it. Likewise, is there anywhere I can try it straight-up before buying the 750mL? Are you in NYC? I’m sure any cocktail bar carrying it will let you have a taste.